PVC Roofing - Old Dominion Roofing & Construction, INC.
PVC roofing systems, sometimes referred to as vinyl roofing, are a common commercial roofing solution. This single ply roofing structure makes it easy for installation on a flat surface. PVC stands for polyvinyl chloride, which is known for being a durable type of plastic. These materials are then chemically bonded together. The PVC is created by a gaseous reaction of ethylene with oxygen and hydrochloric acid. One of the benefits of PVC systems are that they are lightweight and resistant to chemicals. It is also difficult to puncture PVC roofing which will help keep it safe from any outdoor elements. In particular, PVC roofing is resistant to the sun’s harsh UV rays. By keeping out heat from the sun, this will help maintain affordable heating and cooling costs. In addition, PVC roofing is a fire-resistant material and does well in hot environments. It is a roofing solution for people who simple want or need the best. Also, one of the struggles of a flat roofing surface is ponding or puddling water, PVC roofing is resistant to ponding water and often the manufacturer’s will not exclude ponding water from their warranty. 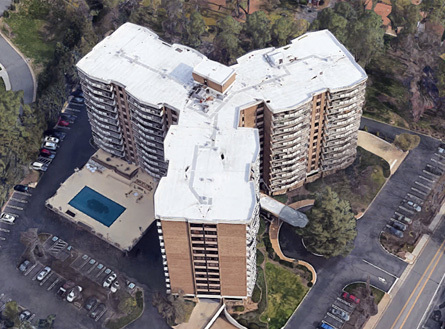 This single layer roofing system has been in use since the 1960s, and has continued to receive improvements that have made it the popular solution it is today. It is created of a thick layer of thermoplastic material. Thermoplastic materials are more flexible and can become soft when heated then become hard once they have cooled. This makes it flexible for any environment that may endure settling.